Disneyland Knitting Book -1. Great vintage Mickey Mouse jumper cardigan babies set 1949. This lovely set worked in vintage 3ply, so try modern 4plyin a tension square is to fit 2-3 years 23 inch chest. Little trousers included. The jumper has Mickey Mouse all round the bottom, chart included. Disneyland Knitting Book -2. Great vintage Donald Duck sleeveles pullover vintage knitting pattern 1949. This lovely little top is worked in vintage 3ply, so try modern 4plyin a tension square is to fit 4-6 years 25 inch chest. Chart included. Ducks go all the way round! Disneyland Knitting Book -3. Great vintage Mickey Mouse beret set 1949. This lovely set worked in vintage 3ply, so try modern 4ply in a tension square. The beret is 9.5 inches across crown and the mittens are 6 inches around palm of hand. The beret has Mickey Mouse all round the crown, and on the cuff of the mittens. Chart included. Very Retro - I had a set like this when I was little - I belonged to the Mickey Mouse Club!! Disneyland Knitting Book-4: Great vintage knitting pattern childs Mickey and Minnie Mouse cardigan 1949. To fit 5-7 years chest 26 inches. Worked in vintage 3ply, so try modern 4ply in a tension square. Emu 8056: Great vintage baby knitting pattern for cardigan with fair isle motifs. Soldier, Bambi, children. Knitted in vintage 4ply, work a tension square to see if you need to use double knitting or larger needles to get size required. To fit chest 20"-23"
Patons 636FC: Great vintage knitting pattern for girls jumper with cats on the yoke 1950s. This lovely pattern is for girls 8-10 chest 28 inches, in vintage 3ply so try modern 4ply in a tension square and see if you need to change needles. There are two designs in this pattern, see bleow for the other one. The cats are unusual and nicely designed. There are charts for both of the designs and they are simple to work. Button fastening at back of neck. Sirdar 7: Very collectable vintage Sirdar Sunshine pattern for 3 cardigans roses, stripes and chickens, 2-4 years old in vintage 3ply, so try modern 4ply and change needles if needed, dont forget to alway work a tension square. Chest 23" -25" measurements. Sirdar 98: Vintage knitting pattern with fair isle borders with dutch childern, Westies, and tradition chequered design. Great for Christmas gifts. Knitted in vintage 3ply, so try modern 4ply. To fit 2, 3, and 4 years.22"-24" chest. 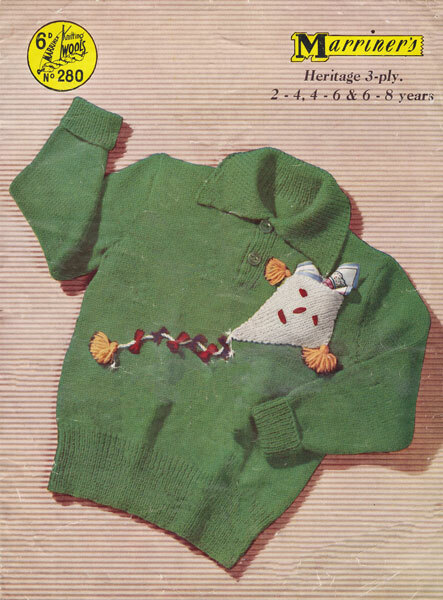 Sirdar 244: Great vintage knitting pattern for babies cardigans with motifs 1969. This lovely pattern has little scottie dogs on one and a car with a caravan and pick up truck and traffic lights for a boy or you can knit it plain or just one of the motifs. Worked in double knitting, I knited this one for my daughter in 1970. To fit 2-3 years 22 -23 inch chest. Wendywear 509: Great vintage boy's cardigan knitting pattern from 1950s. There are instructions for Guardsman on a V neck and a Cable with a V neck to fit 2-8 years or 23, 25 and 27 inch chest for the soldier one and 26 inch chest for the cable. Knitted in vintage 3ply that should knit to modern 4ply, always work a tension square. Guardsman motif is not charted. Wendywear 517:Great vintage button up cardigan knitting pattern with swan motif from 1950s. This lovely design is to fit 18months to 4 years or 21 and 23 inch chest. Knitted in vintage 3ply wool so try modern 4ply with a change of needles if needed. (or modern 3ply if preferred.) Always work a tension square. Wendy 610: Fabulous vintage knitting pattern for girl's jumpers in fair isle from 1950s. There are two design in this pattern - one with little rabbits and an all over fair isle design. The fair isle design is to fit 22 inch chest and the one with rabbits to fit 25, 27 and 29 inch chest. Knitted in vintage 3ply, so try a modern 4ply in a tension square.